Peripheral artery disease (PAD) is one of the most common causes of cardiovascular deaths in the world, with an estimated 202 million people suffering from it in 2010. The contralateral retrograde femoral approach involved in operating during PAD procedures requires the physician to navigate a guidewire through a tortuous pathway of arteries manually. 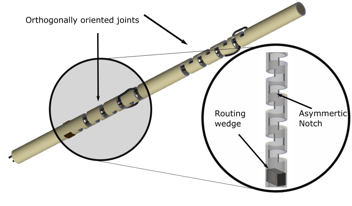 In order to achieve this, we have designed a robotic guidewire with two orthogonally oriented asymmetric notch joints, that offer 2 degrees-of-freedom (DoFs) to the tip of the guidewire. Each of these DoFs is controlled by 100 micron thick tendons that pass through the lumen of the guidewire. The notch joints are etched into a standard Nitinol tube, by micro-machining the tube with an infrared nanosecond laser. This improvement expands the workspace of the guidewire and provides the physician with the ability to navigate at the distal end, to go around a plaque or structures, such as a vessel bifurcation along the path. The outer diameter of this robotic guidewire is 0.78 mm (< 2.4 Fr). To the best of our knowledge, this work lays the foundation for developing the world’s smallest bi-directionally motion capable, multi-DOF, mechanically actuated guidewire.